You can make a limited palette out of almost any two colors, as long as one is cool and the other is warm. For this painting I used ultramarine blue and cadmium red scarlet, together with white. It's basically red, white and blue, so you can call it the "American palette." With two colors that are near complements, it's fun to work over a surface primed with a color from the far side of the spectrum. I'm using blue and red over yellow. The yellow is about 95% covered up, but where it peeks through, it energizes the color scheme like a pinch of spice. 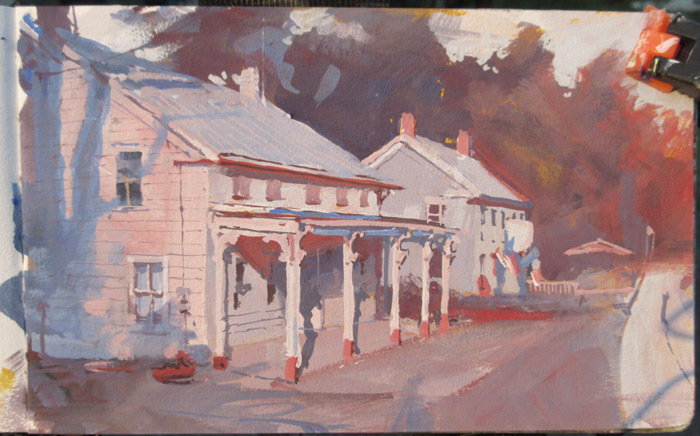 You might try orange + violet + white over a cyan underpainting, or yellow + cyan + white over magenta. You can also introduce black, either as an accent if you want to deepen the darks, or if you want to use it as a color of its own (such as black + orange + white over blue). 2. It's good for beginners because it reduces your choices to light or dark and warm or cool. 3. It puts you into realms of color that you would never think of if you had all the color choices available. I was using casein, but this method would work for any opaque paint: gouache, acrylic, or oil. 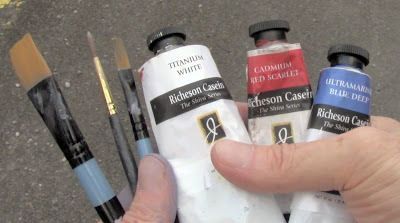 If you're doing the painting in gouache, the priming should be done with a paint that gives a sealed surface (such as colored gesso, acrylic, or acryla gouache) so that wet layers don't pick it up. A wonderful and inspiring study. I love these limited colour paintings they have the look of some of the early magazine illustrations. Great video and very timely for me. 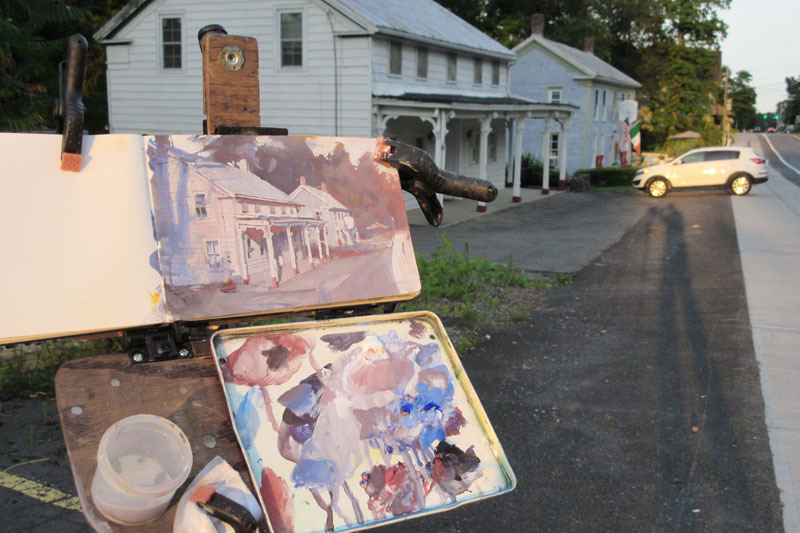 I need to give this a try both to get more comfortable plein air as well as to push my color choices. Thanks. 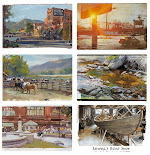 And I love the final painting especially seeing how light filled it is. I realize that you are working with a limited palette here (no green) but I was interested in something you mentioned in the Watercolor in the Wild dvd (while painting the green house I think) that it is a common practice in painting outdoors to paint the overwhelming greenery in the background as a duller grayer color. Just curious about the thought process there since it is not a rule that is used in every piece, so is the decision based on contrast or color focus etc? The greens of midsummer in the Northeast can be fairly intense, so I sometimes soften or gray the colors and look for variation in the greens. For the same reason, I might not want to paint a bright blue sky the way it appears, as it, too, can be overpowering. Limited palettes like this one can help. Was the cad. red scarlet an arbitrary choice or selected because of the red accents in the scene? What an amazing on the spot sketch James! Always inspiring. Thanks man. Speaking of gray, I have a question. Would you recommend any kind of marker for quick black and white studies on regular toned paper (that is, not seized like watercolor paper)? I've read you don't use them anymore as they fade away pretty quiclky, and still am trying to find an alternative to my regular paper. I couldn't find a decent portable hot pressed sketchbook so far. Also, would water brushes filled with gray/shade watercolor paint work decently on bristol board or alike? 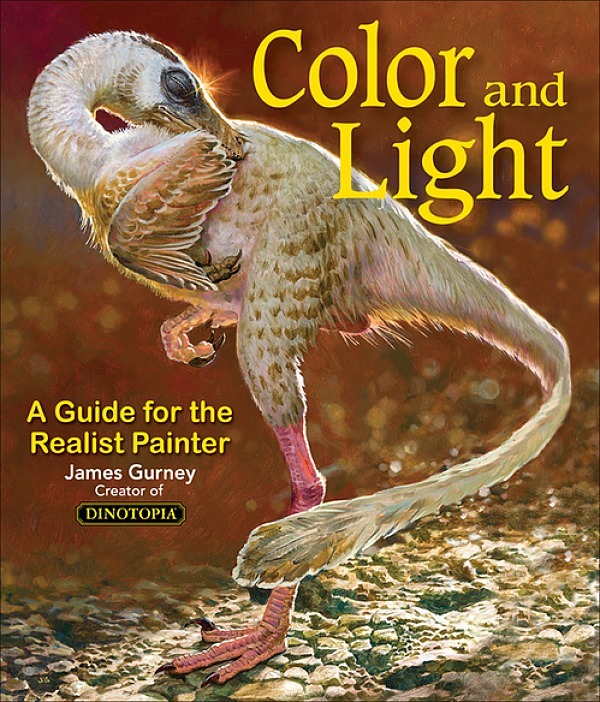 I'm reading your book Color and light, this post was a nice complement to limited pallet section.